When you first save your project, you set the project name or the project title. After that, you can change it at any time. 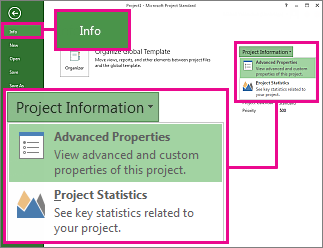 Once you change it, the new name appears when you show the project summary task and in the legend when you print a view. On the right, choose Project Information > Advanced Properties. On the Summary tab, type the new name in the Title box. To get back to your project view, click the back button .